An early sketch of Hobart Town by G. P. Harris ca. 1806 shows the printing office as a small hut next to Government House. It is not known how long it remained there. 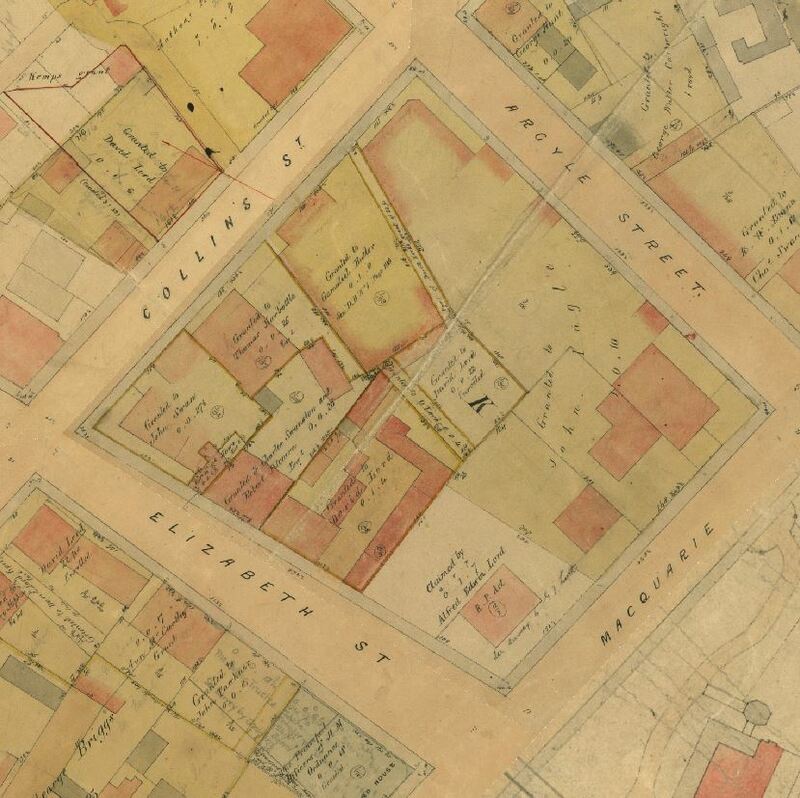 There are numerous contemporaneous references to Bent’s early Gazette Office being in the middle of the block bounded by Collins, Elizabeth, Macquarie and Argyle Streets, roughly next to the GPO building where a small car park now is. These sources include Bent’s own advertisements to let or sell the property shortly before and also after he moved to new premises in 1823. It was described variously as in Collins Street, or at the rear of the Derwent Hotel (which was in Elizabeth Street). On the Collins Street side it lay behind a block belonging to William Paterson. The Bents were living there when Elizabeth was born in 1818. Detail from Sprent survey 1841. Bent’s block is where the large letter K is printed. The house originally fronted onto Collins Street but lost access to the road when the street was realigned according to Macquarie’s plan for the town. At some point prior to 1820 Bent purchased a narrow strip of land from William Paterson (HRA III, iv, p. 846). This right of way was mentioned in later deeds relating to the property and can be clearly seen in the 1841 Sprent survey map, when the block was owned by David Lord. This was clearly the site of the editorial office, but the government press may have been accommodated elsewhere. In 1819 a payment was made from the Police Fund to the Estate of S. Cooper (probably Mrs. Sarah Cooper) for rent of rooms occupied by Government Printing Press during the March quarter (HTG 19 June 1819). Sarah Cooper was known to have had property in Macquarie Street. A statement made by Andrew Magill in 1825, suggesting perhaps multiple skulduggeries, may refer to Bent’s Collins Street property, although Governor Arthur seemed to think Magill meant another property in Elizabeth Street which Bent later sold to John Swan. Around the middle of 1823 two new printing presses and a supply of new type arrived. On 8 November Bent announced that he had moved into a new printing office ‘sufficiently large and commodious enough to allow of almost any extent of business being carried on for perhaps a century to come.’ This two story brick building was in Elizabeth Street near the corner with Melville Street on the block now occupied by McCann’s Music Store. It later became no. 67 Elizabeth Street. The printing office was probably built by Bent’s younger brother, Richard, who was a bricklayer by trade. He had arrived in Sydney in August 1820, as William Wood, under a fourteen-year sentence and in October 1822 came to Hobart to be assigned to his brother. A map from ca. 1828 shows a timber structure adjoining a brick or stone one. The timber building was demolished when, in 1831, Bent began the construction of a large stone house which he used as a residence and a general store in the 1830s. The premises as they existed in the late eighteen thirties are clearly shown in a map by Frankland. The corner block, which was about 36 perches, is on the south east side of Elizabeth Street. The stone house is on the corner, the adjoining printing office set back further from the street and stables are at the rear. The property, described as the ‘Temple Bar of Hobart Town’, was detailed in various newspaper advertisements in the late 1830s. Detail from George Frankland, Map of Hobart bound by Knocklofty Terrace, Elphinstone Road, The Domain, Derwent River and Sandy Bay. ca. 1839. Allport Library and Museum of Fine Arts, TAHO. AUTAS001131821480. Melville Street is the third street north east of the Rivulet. The drapery business was later conducted by W. E. Best, who rebuilt on the site in 1903. An ornamental stone inscribed ‘A. Bent 1831’ was salvaged from the rubble and was still somewhere in the building when Mr. Best sold it in 1926, but has since disappeared. The building adjoining the stone one in this late nineteenth-century photograph must either be a new building or an addition to the front of the original printing office. Bent’s printing office was on the eastern side of Pitt Street, between Market and Park Streets, opposite the School of Arts and roughly where the ANZ tower now stands. Known as Quinn’s buildings.